Russian Prime Minister Vladimir Putin has backed the modernisation of his country's military, less than a fortnight before the presidential vote. "We must not tempt anyone with our weakness," he wrote in a newspaper. Mr Putin is widely expected to win the 4 March election and demonstrations have taken place both against and in support of his likely return to power. President Dmitry Medvedev was meeting opposition movement leaders on Monday in an attempt to calm the protests. It was the first such meeting at the Kremlin since Mr Putin's United Russia party won December parliamentary elections that have been overshadowed by allegations of widespread vote-rigging. Although no information was given by the Kremlin, a leading figure in the opposition movement, Sergei Udaltsov, wrote on his Twitter feed that they would discuss political reform and demands for meetings about fair elections. The meeting came after opposition activists were reportedly involved in a scuffle with pro-Putin supporters outside the Moscow mayor's office on Monday morning, as both sides attempted to file applications for rallies on 5 March, the day after the vote. Hundreds of motorists drove around the Kremlin on Sunday flying white ribbons and balloons - symbols of the protest movement. 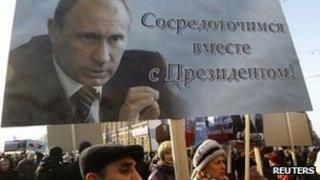 A separate rally took place on Saturday in support of Mr Putin. In his article published on Monday by state newspaper Rossiiskaya Gazeta, the leading presidential candidate said Russia was planning to spend 23tn rubles (£487bn; $772bn) over the next decade on 400 intercontinental ballistic missiles and more than 600 warplanes as well as nuclear submarines and S-400 missile defence systems. Mr Putin said Russia would never give away its potential of strategic deterrence and had to look ahead to the next 30-50 years. Moscow would provide an "effective and asymmetrical" response to Nato's planned missile defence shield in Europe, he said.